BUK453-100A/B PowerMOS Transistor N-channel enhancement mode field-effect Power Transistor in a plastic envelope. The device is intended for use in Switched Mode Power Supplies (SMPS), Motor Control welding, DC/DC and AC/DC converters, and in general purpose switching applications. This is one package pinout of BUK453-100A-B,If you need more pinouts please download BUK453-100A-B's pdf datasheet. 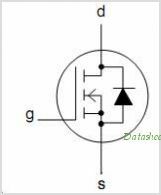 This is one application circuit of BUK453-100A-B,If you need more circuits,please download BUK453-100A-B's pdf datasheet.